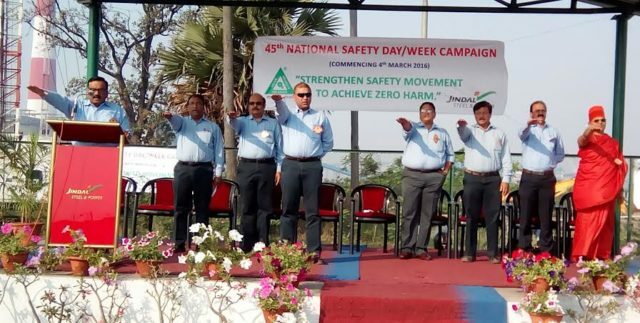 Report by Odisha Diary bureau, Angul: Celebration of 45th National Safety Week has been kick-started with a series of safety awareness programmes at Jindal Steel & Power Ltd, Angul Unit on March 04, 2016. Executive Director and Location Head Mr. DK Saraogi launched the safety week campaign by flagging off the Surakshya Rath, a specialised vehicle carrying safety messages and administering safety oath. “At JSPL, safety is an integral part of our operation. We have adopted global standard of safety rules and regulations to achieve the target of Zero Harm,” said Mr. Saraogi, while launching the campaign. Other senior officials and dignitaries who were present on the occasion and took Safety Oath were Chief Technology Officer Mr. Sabyasachi Bandyopadhyay, EVP and Factory manager Mr. Damodar Mittal, EVP (Power Plant) Mr. Goutam Chandra, VP (HR) Mr. C.D. Mathew, Swami Satyabindu Saraswati and others. This week long campaign has been targeted towards sensitising employees, workers, truckers, commuters and community members in and around the plant to spread the message of ‘importance of safety in everyday life’. The Surakshya Rath is equipped with safety banners, pictorial graphics and audio visual messages with safety messages to spread the awareness.